McMaster Textbook of Internal Medicine is the first Canadian textbook of internal medicine developed at McMaster University, the birthplace of problem-based learning (PBL) and evidence-based medicine (EBM) and one of the leading medical schools in the world. Covering the essential fields of internal medicine, the textbook is aimed at answering the needs of medical professionals as well as residents and students who seek access to updated, verified medical knowledge useful in everyday practice. What makes McMaster Textbook of Internal Medicine unique is the combination of expert authors, pragmatic approach employing the GRADE system, and accessibility. The reasons for the development of McMaster Textbook of Internal Medicine included an increasing need for on-demand access to reliable information, growing cost of many resources, and our belief in the ability to meet the needs of medical professionals accurately. In short, our goal is a textbook that is practical, accessible, current, and affordable. The team behind McMaster Textbook of Internal Medicine includes nearly 500 experienced contributors from North America and Europe. By combining the expertise of authors from around the world, McMaster Textbook of Internal Medicine boasts a uniquely broad and versatile approach that enhances the practical value of the book. As a fully electronic resource, McMaster Textbook of Internal Medicine takes advantage of the digital format to supplement the text with additional materials, such as lectures, talks, reviews, and links to external articles. One of the remarkable features of McMaster Textbook of Internal Medicine is the use of GRADE indicators, which support physicians in making evidence-based decisions regarding treatment. Use of this system allows explicit differentiation between strong and weak recommendations. The indicators appear next to selected statements and provide information on the strength of a given recommendation as well as grounds on which it is based. For a detailed description of GRADE, please visit our introduction to the GRADE System. The authors of McMaster Textbook of Internal Medicine have extensive hands-on experience in treating patients around the world. Being remarkably successful in translating this knowledge into practical instructions for other medical professionals, many of them have also participated in the development of clinical practice guidelines and consensus statements, which shape the modern medical practice. Many of our authors have been also involved in pioneering research and designed groundbreaking clinical trials that guide today’s clinical practice. For a detailed list of editors and authors, please visit: Editors, Authors. 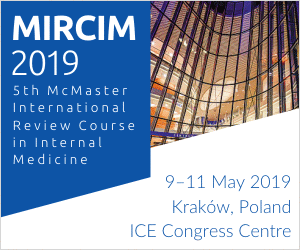 The origins of McMaster Textbook of Internal Medicine can be traced back to Kraków, Poland, the home of Jagiellonian University, which is one of the oldest medical schools in the world. 2005 saw the publication of Interna Szczeklika, an internal medicine textbook edited by the late Professor Andrzej Szczeklik, a renowned Polish physician and scientist. The textbook, written in accordance with the principles of evidence-based medicine, has become the cornerstone of medical education in Poland, available in paper edition as well as a web-based textbook and a mobile app. In 2014, the authors of Interna Szczeklika were joined by editors and contributors centered around McMaster University, the birthplace of evidence-based medicine. At subsequent stages, additional expertise was provided by clinicians from North America and Europe. The result of their collaboration is McMaster Textbook of Internal Medicine. Expanded in scope and adapted with North-American readers in mind, the textbook employs GRADE system indicators and offers a unique, pragmatic approach to internal medicine. The ultimate goal of McMaster Textbook of Internal Medicine is to create a comprehensive, reliable, up-to-date resource that will be useful to internists, all subspecialists, general medical practitioners, and medical students, both in ambulatory and in-patient settings. With medical knowledge expanding all the time, our journey has only just begun. We invite you to join us not only by using the McMaster Textbook of Internal Medicine in your practice, but also by providing us with your feedback, pointing out potential omissions or inconsistencies, identifying needs for updates, and suggesting new features that you would find useful in your everyday practice. To submit your comments, queries, or ideas, please visit our site for providing feedback.